There’s nothing more confusing than following all of the steps suggested by popular hair bloggers and vloggers and still ending up with frizzy, brittle hair. Especially when you learn the wonders of sealing with an oil or butter for longer lasting hydration, but still wake up with thirsty strands by the next morning. What gives? Well, it may be your hair’s porosity. What is porosity? It’s your hair’s ability to absorb water, products and moisture overall. The ranges are broken down into 3 poroisty levels: low, normal and high. Here’s a strand test followed by a break down of each range, what it means for your hair regimen and how to repair it. Next time you wash your hair, grab a strand and drop it into a glass of water. If the strand immediately sinks to the bottom, then your hair is of high porosity. If it floats somewhere in the middle with ease, then it’s of normal porosity. If it seems to stay at the top, taking forever to sink downward, then your strands are of low porosity. 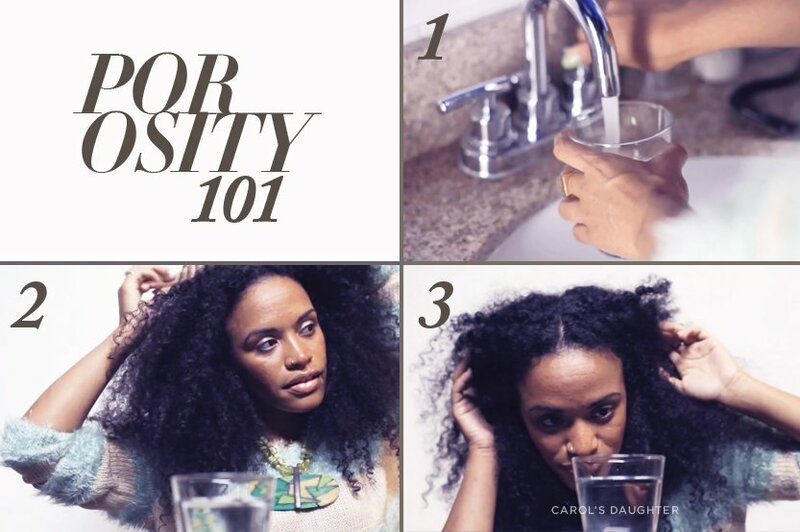 What does low porosity hair mean? It means your cuticles are tight and pretty resistant to opening up for water and moisture. This is more than likely due to genetics. Does it usually feel like products you apply are just sitting on top of your hair? Your hair doesn’t readily absorb products; hence its inability to retain the moisture and shine your hair needs. The strand stayed at the top of the glass because water couldn’t get inside of it to make it sink. The tricky part of having low porosity hair is how well it can actually hold moisture once inside, but getting it inside is the key! Beware of products with a low pH because high acidity works to keep the cuticle closed. In other words, they won’t help your case! Look for products using more alkaline ingredients that will help lift your cuticles. Regular baking soda treatments (Google: Cherry Lola Treatment) or products containing glycerin may help improve moisture levels. Granted, many naturals have issues with both ingredients so test them out for your particular hair type and see if they help! Try avoiding products loaded with oils, as oils serve as sealants for the cuticle and may work against your efforts to lift them. Steamers are great tools for aiding with cuticle lifting, as well. And when applying products, make sure your hair is damp, as you’ll need all the moisture you can get! What does normal porosity hair mean? It’s pretty self-explanatory! It means your strands allow for easy moisture inside the cuticle. This range tends to take color and perms better than the other two. And will also hold moisture and shine for a longer period of time. It’s essentially considered a very desirable and low maintenance hair type. However, be aware that regular chemical processes, including heat, can change the hair’s porosity over time. Healthier ingredients, regular deep conditioning, moisturizing and little to no heat regimens will help keep normal porosity strands at optimum health. 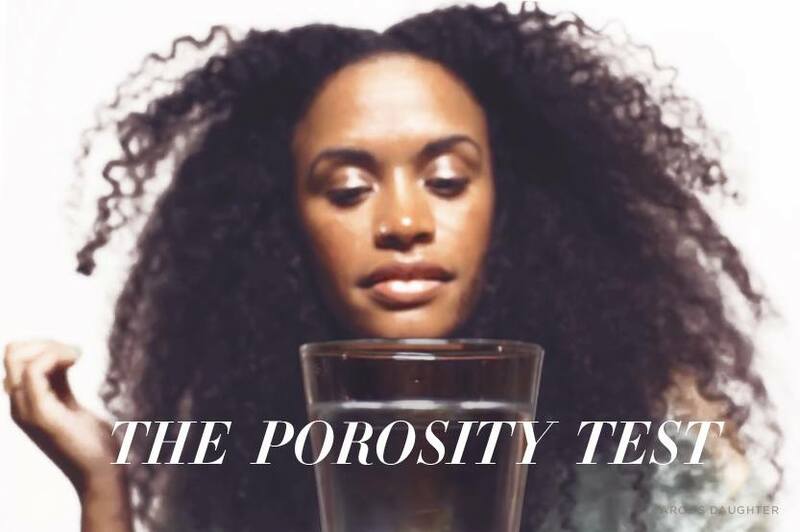 What does high porosity hair mean? It means your cuticles have been exposed to a severe amount of damage, either through environmental factors or the overuse of heat and chemical processes. Does your hair seem to stay wet for a long time? Or do your strands feel as though as quickly as they absorb moisture from your products is as quickly as they lose it? Your strand sank to the bottom of the glass because of the gaps and large openings, allowing for the entrance of more water, all throughout the cuticle. Thicker butters and products with more oils are helpful for this hair type as they will seal the cuticle and even serve as a protective layer. You want to use things with a low pH, which are acidic, and will help tighten the open cuticle. Sealing with pure Aloe Vera after applying your leave-in will be extremely helpful. A regular apple cider vinegar rinse, diluted with 2 cups of water, will also help detoxify any pollution (from being so openly vulnerable to the elements) and help seal the cuticle. Protein treatments are also recommended to temporarily patch the gaps. The truth is, there is no repairing overly porous hair. These regimens will help make it more manageable but regular trims, so you can focus on the new growth, and a major halt in the use of heat and chemicals will be key. No matter how high or low your porosity levels are, we have the best blends for your hair.